I’ve been returning to the same stretch of coastline for the best part of year now, while I continue to enjoy my early morning jaunts, one of my friends suggested that I’ve gotten stuck in a rut. I would argue against that, I am after all making photographs that I particularly enjoy and I don’t feel as though I’m repeating myself. Yet, the rocks are becoming awfully familiar. So are we all done here? That was the question that was going through my the morning that I made the photo above. It was already much lighter than I like for my photographs but the line of the rock caught my eye and I stuck around to make a few frames. 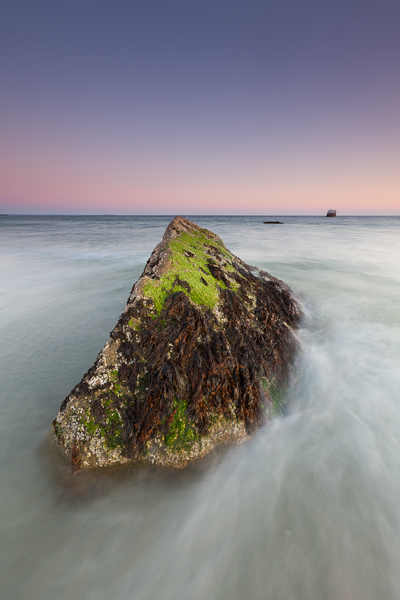 This entry was posted in Photo of the Week and tagged Beach, Close to Home, Glacial Erratics, Motion, Ocean, Portfolio, Rocks, Sand Sea Sky by nixonphoto. Bookmark the permalink. Sometimes it’s hard to tell; Am I “working a location”, or am I stuck in a rut? There’s something to be said about exploring around a particular location, finding more compositions, or even new vistas. I say work it until you’re sick of it. And maybe beyond, if it’s for a project. I’d like to think that I’m ‘working the locatiosn’ since keep finding new things to photograph at this same beach even though I’ve been going there, if not weekly, certainly monthly basis for over a year. Writing about it has quieted the chattering demons at least for now. The angle and the colors are wonderful. Every day brings different light, bringing about subtle and not so subtle changes in a location. So there’s always something different in the “same old place”. Nice capture Andy! Thanks Ginny! I’d like to think that different weather, times of day, times of year all change the same old view. Funny how the things people say stick in your head.